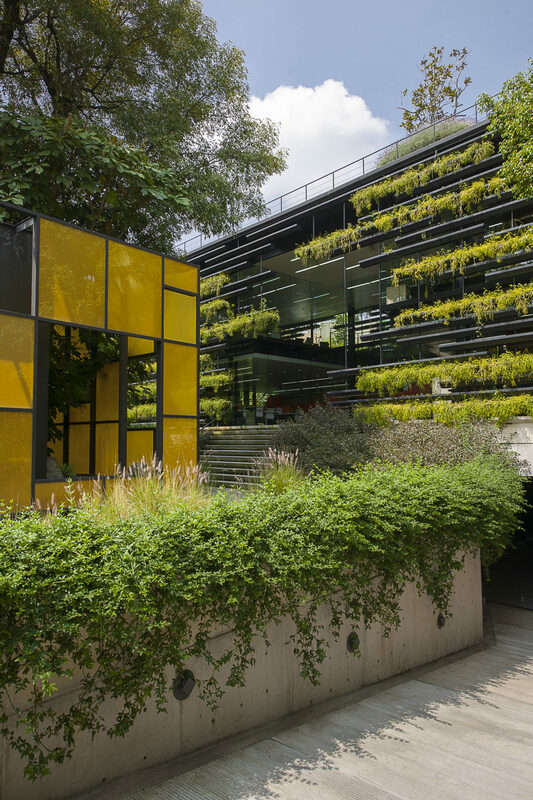 Falcón II headquarters, an extension of a previous project by Rojkind Arquitectos, is a transparent box full of natural light and undisturbed garden views. 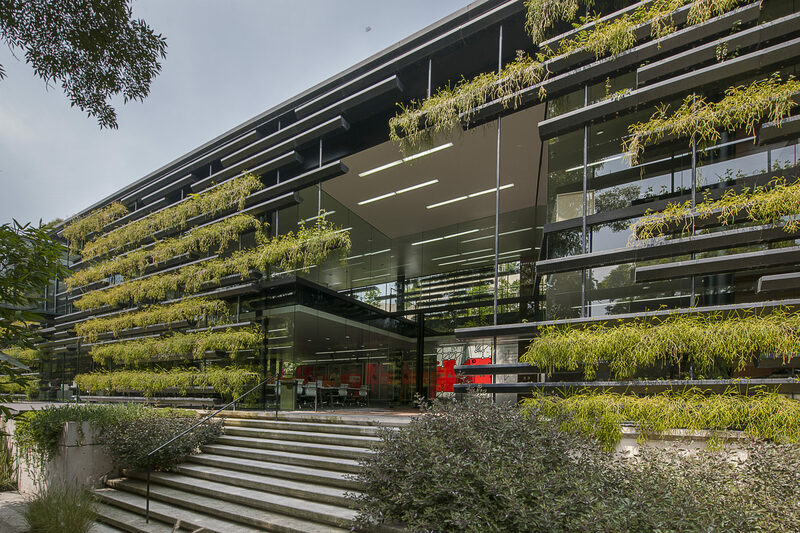 Following the successful completion of Falcón I headquarters in 2003, the client retained Rojkind Arquitectos for the design of its expansion. 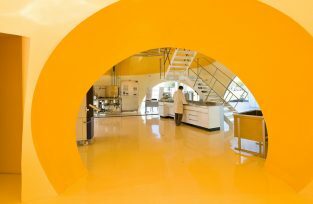 Falcón, a supplier of medical equipment and instruments, had outgrown its previous space and was in need of additional office area as well as space for a showroom and employee amenities. 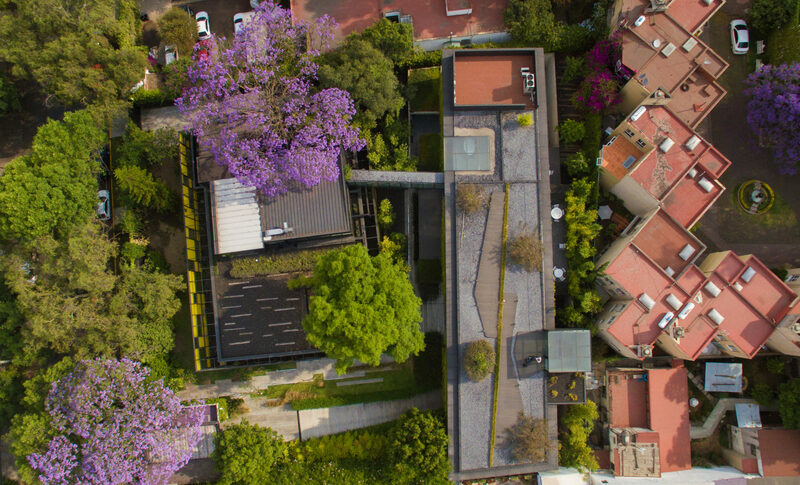 Falcón headquarters are located at the heart of the traditional, and mainly residential, neighborhood of San Ángel in the southern quadrant of Mexico City. This historic area is known for its colonial architecture, amazing gardens, low buildings, and cobblestone streets. 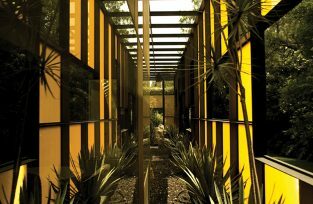 In Falcón I, the main house of a walled-in existing residential complex was completely renovated, becoming a yellow glass box floating in the garden with interstitial landscaping behind its facade and strategically framed views to the outside. 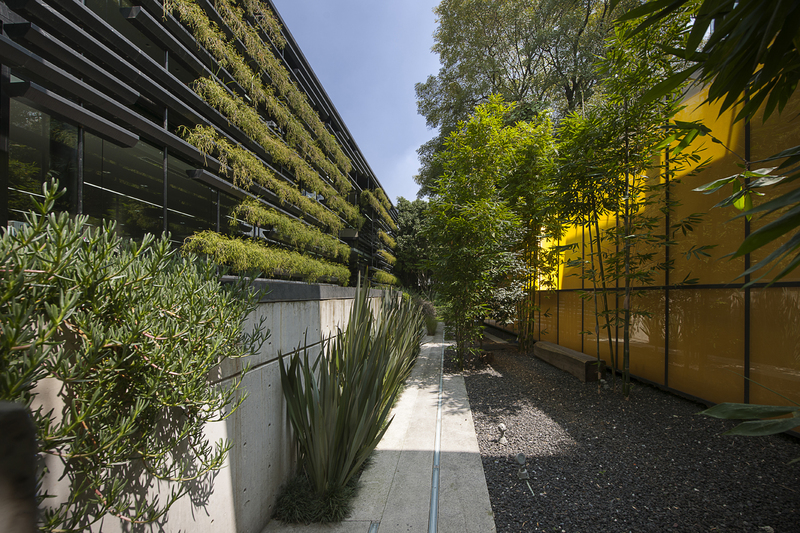 The Falcón II expansion was conceptualized as an extension of the garden itself so that it would complement the main building and preserve its green views. The visual connection between interior and exterior was emphasized. 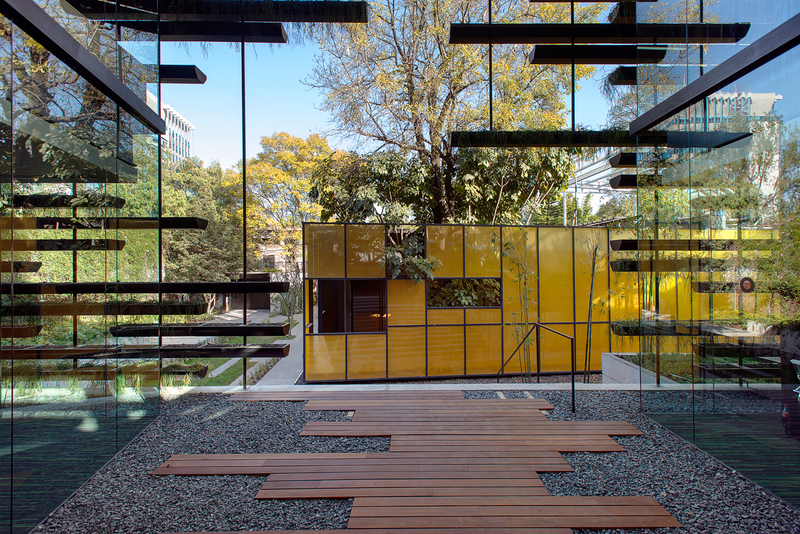 The new building was positioned directly behind the yellow glass box of Falcón I on the footprint of an existing structure that was demolished to allow room for new underground parking and a two-story structure. One of the main challenges to overcome was the proximity to the existing building. 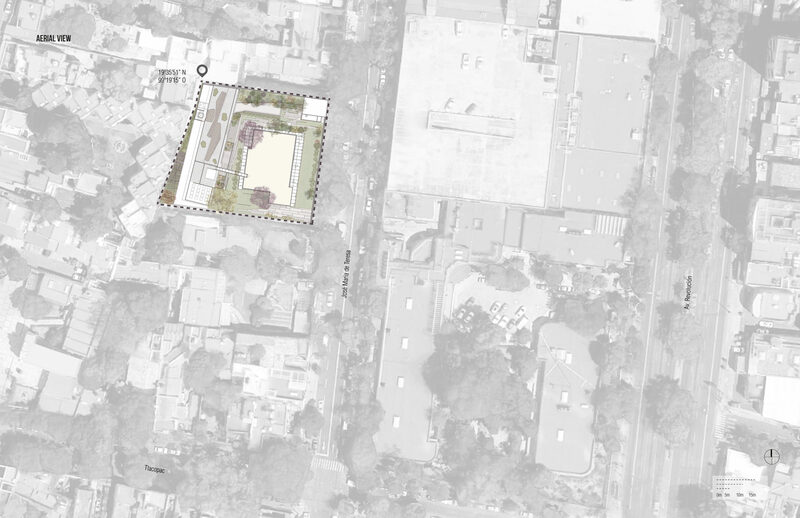 Rojkind Arquitectos invited Gabriela Etchegaray to collaborate on the design of this project. 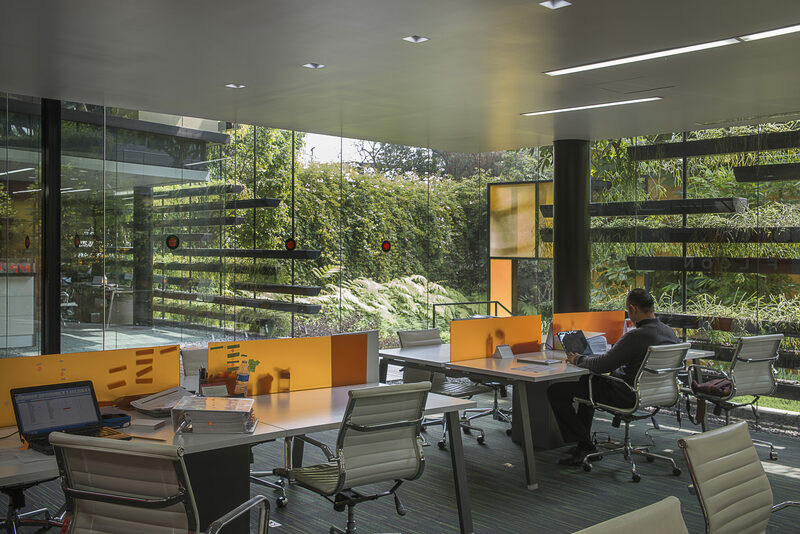 The team decided to create a simple transparent rectangular box to contain the expansion with plenty of natural light and undisturbed garden views. 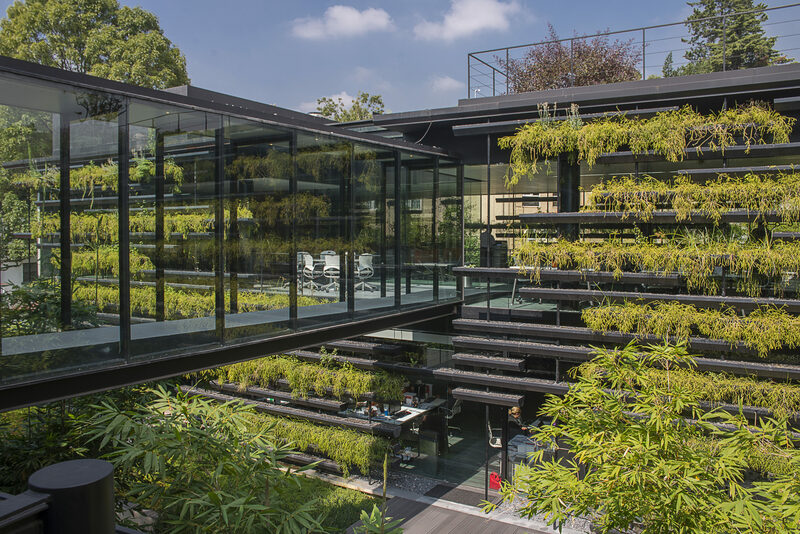 A transparent glass wall curtain was fronted with a sun control layer composed of 510 modular planters arranged in an offset linear configuration that continue the feel of the garden over the façade. 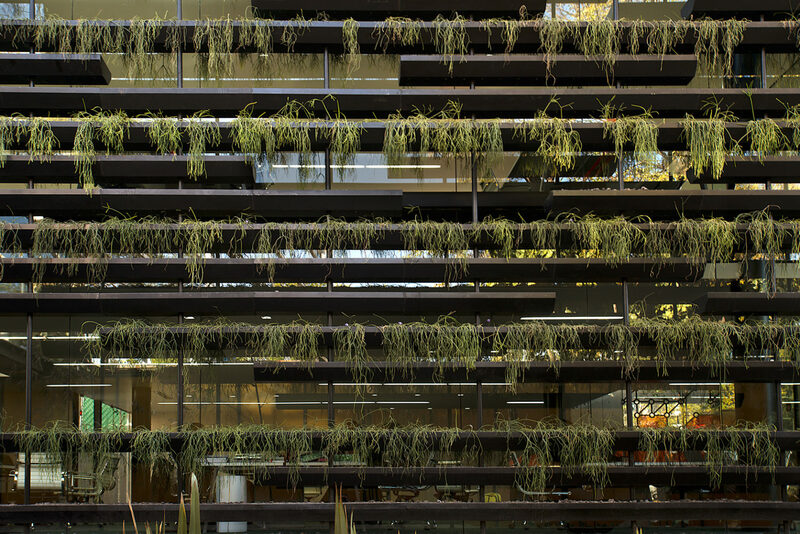 The drip-irrigated planters also help cool the building through passive solar design. 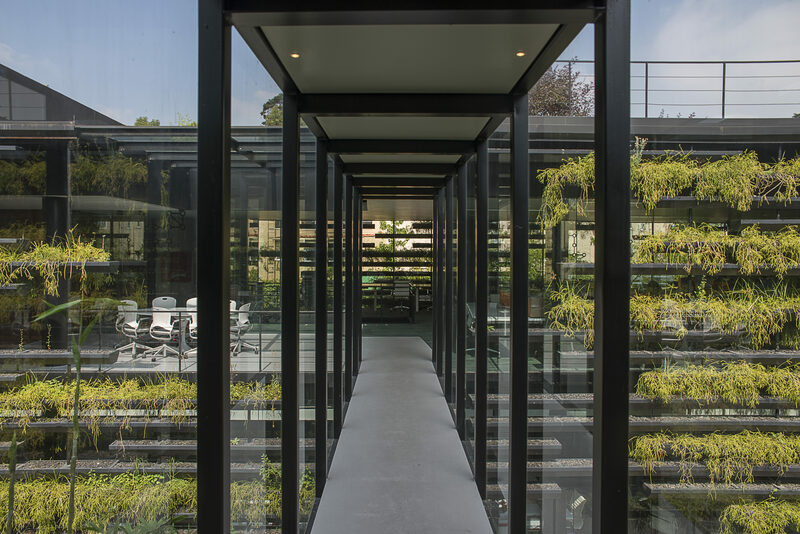 The garden was then strategically brought to the inside of the glass rectangle through double-height atriums that give the interior a lofty feel. 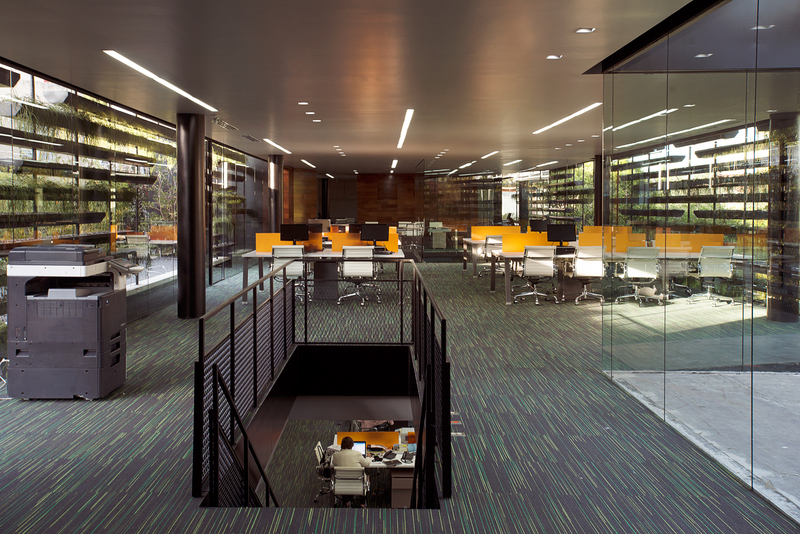 Vertical circulation was grouped at the back to preserve the sense of transparency. A bridge connects the rooftop part of the expansion with a new employee dining hall placed over the existing Falcón I building. Extensive landscape of the surrounding grounds and a new street entry structure complete the overall design.